'Who thinks that electric or hybrid cars are something new, is soon to be disappointed. It were curiously enough the first cars. In 1828, Ányos Jedlik, a Hungarian who invented an early type of electric motor, created a small model car powered by his new engine. In 1834, Vermont's blacksmith Thomas Davenport built a similar apparatus that worked on a short, circular, electrified track. In 1834, Professor Sibrandus Stratingh from Groningen and his assistant Christopher Becker created a small-scale electric car powered by rechargeable primary cells. It did not stop there. The English inventor Thomas Parker, who was responsible for innovations such as electrification of the London underground, tram lines in Liverpool and Birmingham, and the smokeless fuel charcoal, built the first electric production car in London in 1884, using its own specially designed rechargeable battery. with high capacity batteries. He was very much concerned about the harmful effects of smoke and pollution in London. (so-called killer smog = smoke and fog). The first electric car in the United States was developed in 1890-91 by William Morrison from Des Moines, Iowa; the vehicle was a wagon with six passengers that could reach a speed of 23 kilometers per hour (14 mph). It took until 1895 before consumers started paying attention to electric vehicles. Races were held and 'speed' records were broken, everything to promote the new drive. One of the most notable of these records was the breaking of the 100 km / h (62 mph) speed barrier, by Camille Jenatzy on April 29, 1899 in his 'rocket-shaped' vehicle Jamais Contente, which reached a top speed of 105.88 km / h ( 65.79 mph). Camille was Belgian and was called 'diable rouge', the red devil, this in response to his red beard. It was a milestone, something like many years later breaking the sound barrier with jet planes. It put the electric car on the map .. 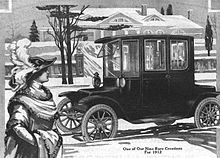 In New York City, the Samuel's Electric Carriage and Wagon Company started using 12 electric taxis. The company ran until 1898 with a maximum of 62 taxies, until it was converted by its investors to become the Electric Vehicle Company. Electric vehicles had a number of advantages over their competitors from the beginning of the 20th century. They did not have the vibration, the smell and the noise of petrol cars. They also did not require gearboxes, so there was no need to switch gears. (cars on steam did not have to switch either, but they suffered long start-up times of up to 45 minutes on cold mornings.) The electric cars were also preferred because they did not need manual effort to start, just like petrol cars with a hand crank to start the engine. Electric cars were popular with wealthy customers who used them as city cars, where their limited range proved to be even less of a disadvantage. Electric cars were often placed on the market as suitable vehicles for female drivers because of their ease of use. Acceptance of electric cars was initially hampered by a lack of energy infrastructure, but in 1912 many homes were cabled for electricity, increasing the popularity of the cars. In the United States 40 percent of the cars were powered by steam at the turn of the century, 38 percent by electricity and 22 percent by gasoline. A total of 33,842 electric cars were registered in the United States, and the US became the country where electric cars received the most acceptance. Most early electric vehicles were huge, graceful carriages designed for the well-to-do class customers. They had luxurious interiors and were full of expensive materials. Sales of electric cars peaked in the early 1910s. In order to overcome the limited operational range of electric vehicles and the lack of charging infrastructure, a replaceable battery service was conceived for the first time in 1896. The concept was put into practice for the first time by Hartford Electric Light Company via the GeVeCo battery service and initially available for electric trucks. The owner of the vehicle bought the vehicle from General Vehicle Company (GVC, a subsidiary of General Electric Company) without a battery and the electricity was purchased from Hartford Electric via a replaceable battery. The owner paid a variable kilometer charge and a monthly service fee for maintenance and storage of the truck. Both vehicles and batteries have been modified to allow a quick battery exchange. The service was provided between 1910 and 1924 and covered more than 6 million miles during that period. From 1917, a similar successful service was carried out in Chicago for owners of Milburn Wagon Company cars that could also buy the vehicle without the batteries. Yet the electric car lost pole position against petrol cars. The electric car began to lose its position in the car market. A number of developments have contributed to this situation. By the 1920s, an improved road infrastructure required vehicles with a greater range than those offered by electric cars. Worldwide discoveries of large petroleum reserves have led to the wide availability of affordable petrol, making it cheaper to travel with gasoline cars over long distances. Electric cars were limited to urban use due to their low speed (no more than 24-32 km / h or 15-20 mph and low range (50-65 km or 30-40 miles), and gasoline cars could now travel farther and faster than that and the power network ran only around the densely populated areas.The gasoline car made people in the outside areas independent of electric power. Here Ford with his 'Bucket T' stepped in and every farmer who chose a car went for the Bucket T.
Petrol cars became even easier to operate thanks to the invention of the electric starter by Charles Kettering in 1912, so that a hand crank was not necessary to start a petrol engine and the sound of petrol cars became more bearable thanks to the use of the damper, which Milton O Reeves and Marshall T. Reeves in 1897 had invented. Finally, the introduction of mass production of Henry Ford petrol vehicles lowered their price. On the other hand, the price of comparable electric vehicles continued to rise; by 1912 an electric car was sold for almost twice the price of a petrol car. Most manufacturers of electric cars stopped production at a certain time in the 1910s. Is there really nothing new under the sun? Hmm, actually, yes! The same ideas with a different or improved effect come along in a cyclic dance that suggests that there is indeed little news under the sun. What about bio fuel in 1917. The pictured car is a McLaughin model E35 and is exhibited in the museum of Saskatchewan, Canada. Saskatchewan is a prairie state with grass and grain fields as far as the eye can see and far beyond. Farms of 3000 hectares are common and no exception. For the rest there are endless plains and ther for the state is called 'the land of the living skies,'. Far distant plains with a clouds above it. A chemistry professor from the University of Saskatchewan must have wanted to put this to use, so many grass plains and no infra structure, read petrol pumps or electrical networks, except in the big cities. 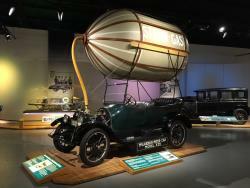 The straw gas car was built in 1917 by a technical professor from the University of Saskatchewan. In London he ordered a balloon-like reservoir that was mounted above the passengers on a scaffolding.' No shortage of grass here,'he must have thought and placed a moist straw bale in the reservoir. the solar heat on the structure started a chemical reaction, as you sometimes have with hay stacks. Methane gas formed and found its way into the combustion chambers of the engine. Beautiful organic combustion, something like bio-diesel.